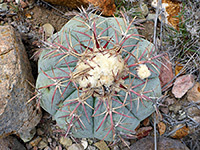 Although mostly a plant of the Chihuahuan Desert of New Mexico and Texas, echinocactus horizonthalonius is also found in far south Arizona (the nicholii variety), in and around Organ Pipe Cactus National Monument, where specimens are generally larger than in the east - up to 12 inches tall. Six inches is more typical. The attractive, slow growing species has broad ribs bearing clusters of (5 to 8) radial spines growing close to the body, and a curved central spine pointing downwards, giving a generally stout, compact appearance. 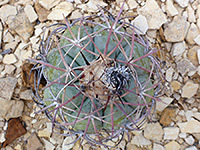 The greenish-gray surface is not obscured by the spines. 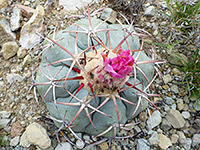 Bright pink flowers form at the top in early summer, growing out of a dense mat of woolly hairs.